The resource world on the CaveTale server exists so people have a place to harvest materials from without having to worry about ruining the landscape or taking away valuable resources. This world is reset with a brand new seed every now and then, so there is a constant supply of new resources. In this world, it is not possible to set homes or make claims. The resource world comes with a nether, so building a nether portal will bring you to a nether world which is also regenerated on a regular basis. There is a portal at spawn that will bring you to a random location in the resource world. If you want to pick where to go, use the command. /Resource – This command will give you a list of available biomes. 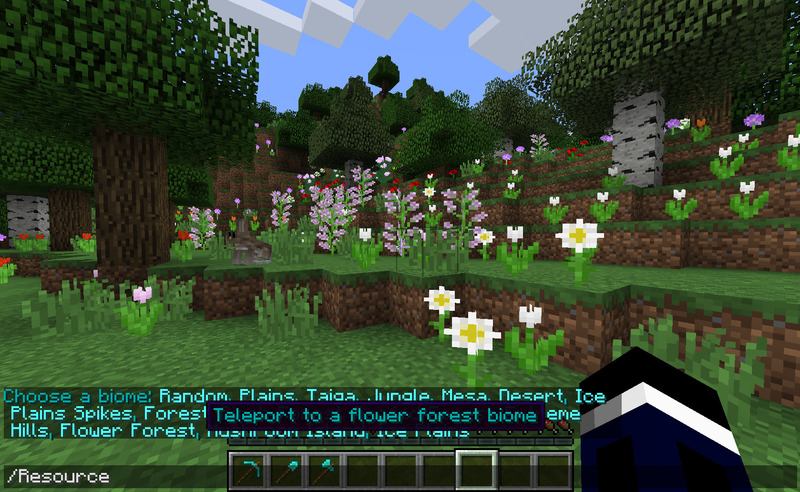 Click the biome of your choice to be teleported there. This is free of charge. Since this world has a special utility, other than the building worlds, a couple of restrictions apply. There is no protection against griefing in this world. Whatever you build in here, can and will be destroyed eventually. You cannot set home in this world. Use the /Resource command to find the location of your choice. You cannot make claims in this world. Whatever you find in there can be harvested by others, and whatever you build destroyed. There is no spawn location in this world. To go back to another world, use /Spawn or any of your homes.